Gwadar International Airport (IATA: GWD, ICAO: OPGD) is an international airport situated 14 km (9 miles) north of the city centre of Gwadar, in the Balochistan province of Pakistan. The town of Gwadar was purchased by Government of Pakistan from the Sultan of Muscat in 1958. Air operations started in 1966. The airport gained international status when two weekly flights from Karachi to Muscat via Gwadar were initiated.[when?] The terminal building was inaugurated in 1984 and new departure/VIP lounges opened in 2008. It is a large airport in Balochistan, Pakistan, as it operates to cater mainly to the population of Gwadar. 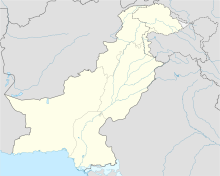 Pakistan International Airlines, the main airline flying out of the airport, connects Gwadar to Karachi, Turbat, Quetta, Peshawar, Islamabad, Lahore, Dubai, Qatar, Kuwait City, Riyadh, Tehran, Mashhad, Bahrain and Muscat. Other airlines had recently launched their flights to Gwadar and currently had been doing pretty well due to successful performance. These included Oman Air, which flew to Muscat using ATR 42 aircraft, and Airblue, which started twice daily flights to Karachi through its joint venture partner JS Air. Four narrow body aircraft can park at the apron at one time. Every type of jet can land here. One domestic and one International lounge. Fire services, NDB, standby generators are available. 24-hour priority notice for unexpected arrival into the airport. Prime Minister Imran Khan had laid down the foundation stone for the New Gwadar International Airport (NGIAP) at Gwadar on 29 March 2019. Located in Gurandani which is some 26 kilometers northeast of Gwadar city in Balochistan province. New Gwadar international airport is expected to cost $246 million, It is fully funded by China as grant. This greenfield airport will include a modern terminal building alongside a cargo terminal with an initial handling capacity of 30,000 tones a year. New Gwadar International Airport will have the capacity to accommodate aircraft's including narrow body aircraft's such as ATR-72 & Boeing B 737 and the wide body aircraft's including Airbus A-380 & Boeing B 747 for international and domestic routes. It will have a single runway with 3,658 meters of length and a width of 75 meters that will have the capacity to accommodate wide bodied aircraft's. A taxiway of 23 meters length alongside 10.5 metres paved shoulders for both sides. Airport will also have the capacity to build the 2nd runway in the north direction of the first runway. Air traffic control (ATC) tower, crash, fire & the rescue facilities will be build, a fuel farm will also be built. CAA Pakistan had awarded design to build contract of the new airport to the China Communications Construction Company (CCCC), which is expected to be completed in 2022. ^ Airport information for OPGD at World Aero Data. Data current as of October 2006.Source: DAFIF. ^ Airport information for GWD at Great Circle Mapper. Source: DAFIF (effective October 2006). ^ "Statistical Data for Web site Major Traffic Flow Airport & Airline wise - Pakistan Civil Aviation Authority". www.caapakistan.com.pk. ^ Baloch, Behram. "Gwadar & Sultanate of Oman | Balochistan Inside". Retrieved 22 April 2019. ^ "New Gwadar International Airport, Pakistan". Airport Technology. Retrieved 22 April 2019. ^ "Prime Minister Open Work On New Gawadar Airport". UrduPoint. Retrieved 21 April 2019. ^ "Pakistan's Gwadar International Airport will be the largest in the country". gulfnews.com. Retrieved 21 April 2019. ^ "Construction work on Gwadar airport to begin in April". www.thenews.com.pk. 4 February 2019. Retrieved 22 April 2019. ^ "Development of Gwadar will benefit entire world: PM". www.radio.gov.pk. Retrieved 22 April 2019. ^ "New Gwadar International Airport | China-Pakistan Economic Corridor (CPEC) Official Website". cpec.gov.pk. Retrieved 22 April 2019. ^ Tribune.com.pk (29 March 2019). "Imran launches work on mega projects in Balochistan". The Express Tribune. Retrieved 22 April 2019. This page was last edited on 23 April 2019, at 19:43 (UTC).